WE'VE GOT YOU COVERED WITH THIS OFFER! This innovative, upside down umbrella turns "inside-out" when opened at the press of a button. 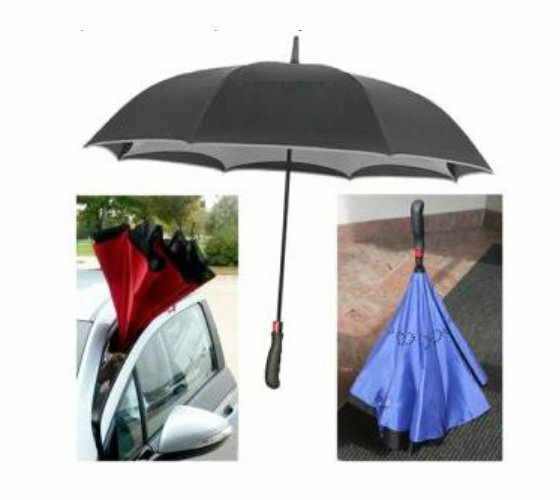 Practical design makes it easier to open and close during a downpour, preventing water from drenching your arm and shoulder while entering or exiting your car. Plus, enjoy no annual fee and get a special intro APR on balance transfers! Visit our branch or call us for more information. Gift available while supplies last and limited to one per customer. Picture used for illustrative purposes only, actual gift may differ in color or appearance. *Completed Personal Credit Card application must be submitted in branch or online to obtain gift. If application is submitted online, customer must bring online application confirmation page to branch in order to receive gift. Gift will be awarded in branch immediately upon submitting the application or showing online application confirmation page. Credit cards subject to credit review and approval. Credit card approval is not required to obtain free gift. Cards are issued by TCM Bank, N.A.